I know, I know, it's not at a very attractive stopping point, the inner border line isn't even done but I'm tired. 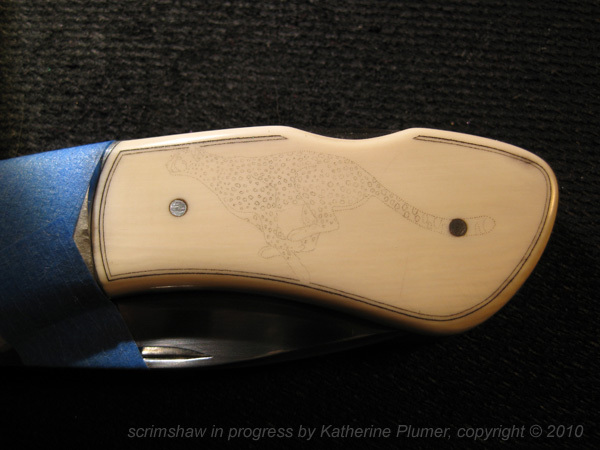 Doing the image transfer for the cheetah took so flippin' long! Borders and transfers make me hold my breath and grit my teeth. It's pretty smooth sailing after that! I am also putting a lot of time on my metal engraving practice. Fiddling around with practice plates just wasn't working for me, so I'm engraving a key fob and learning SO MUCH in the process. Wow. Creating an actual image, a real project, works sooooo much better for me than scratching randomly at practice plates. It's full of mistakes, I don't care, I am learning so much and improving so much as I go. I'm trying all sorts of different gravers, finding that I like some and hate some. I definitely plan to ink it when I'm done. I know there are plenty of purists out there who don't believe engravings ought to be blackened but I'm afraid I'm not one of them. I figure if I spend that much time on something I'd like to be able to see it from all angles. At least, that's my theory of the moment. My theories are subject to change without notice.